Our friends from Grow Wild, who this year funded both our foraging hedgerow and wild flower meadow areas, visited us last month and have written this wonderful article about our work. The Comfrey Project in Gateshead provides refugees and asylum seekers with a safe, welcoming environment, promoting personal wellbeing through a sense of place and belonging. This year participants at the project have planted a ‘Foraging Hedgerow’ and grown wild flowers on an unused area of their community garden, funded by Grow Wild, the national outreach initiative of the Royal Botanic Gardens, Kew. Sultan, 48, from Pakistan has been part of the project for four years. “I like the digging for exercise,” he says, “I dig for two or three hours, hard work. I’m in much better shape now in my body,” he laughs. Whilst the centre is facilitated by project workers, the participants are fully involved in the construction, maintenance, growing and running of the garden, as well as cooking at the centre and of course socialising. Grow Wild is the UK’s biggest-ever wild flower campaign, bringing people together to transform local spaces with native, pollinator-friendly wild flowers and plants. The Comfrey Project in Gateshead is one of 232 Grow Wild funded community projects across the UK. 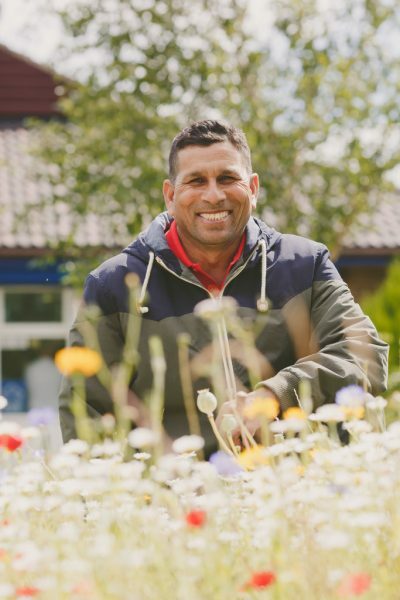 “The Comfrey Project helps me and I can help the Comfrey Project,” Sultan says proudly, “I look after the garden and cook the food. Everybody is always asking me ‘Sultan, please cook again’. They like my vegetable curry. “Everybody respects me here and I respect them. It’s very nice,” he says. Being respected and feeling useful may seem like simple things, but to Sultan they are highly valued. There’s a vast array of plants growing at The Comfrey Project, sourced from all over the world. They are all thriving in the community garden in the north of England. “If that plant can survive winter here, then so can I,” says one of the other participants. Through Grow Wild, millions of people are doing something positive where they live; connecting with wild flowers, plants and places around them, taking notice of nature, getting active, learning new things and sharing their knowledge and enthusiasm. It’s not just knowledge of nature and wildlife that participants are gaining. “I have improved my English a lot since I have been coming here,” says Sultan, “In the beginning I was saying ‘what is this gar-den-ing?’ But now I understand at least 75% of what people say to me. The Comfrey Project plans to keep expanding the garden with new and exciting activities for both refugees and asylum seekers and local people too. “Gateshead is a tough place to live in the recession,” says Craig Wilson, from the Comfrey Project. “But the people here are warm and hardworking. We’ve got a few people who live locally who come and help and enjoy the garden, as well as disabled adults, young offenders and ex-service people.